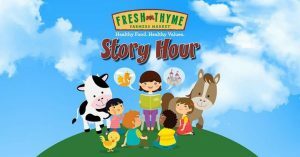 Shop at Fresh Thyme in Newport? Buy a Giving Bag and help our environment and the library! 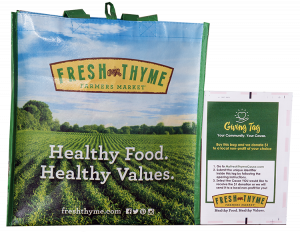 For every $3 Giving Bag sold during the month of April at the Newport Fresh Thyme, the library will receive a $1 donation. In addition to benefiting the library, you also benefit the environment because you are choosing a more eco-friendly way to bring your groceries home. The Giving Bags are located on displays around the store and at the check-out. You’ll know you have the right bag when you see the attached Giving Tag. The Newport Fresh Thyme is located at 82 Carothers Road in Newport, KY.
Purchasing the Giving Bag for friends, family, colleagues and/or members of any groups with whom you are involved is a terrific idea! The Giving Bag makes a great gift and shows support for the community at the same time. For information on bulk orders, please contact freshthymeinfo@bags4mycause.com.